The perfect summer gift! 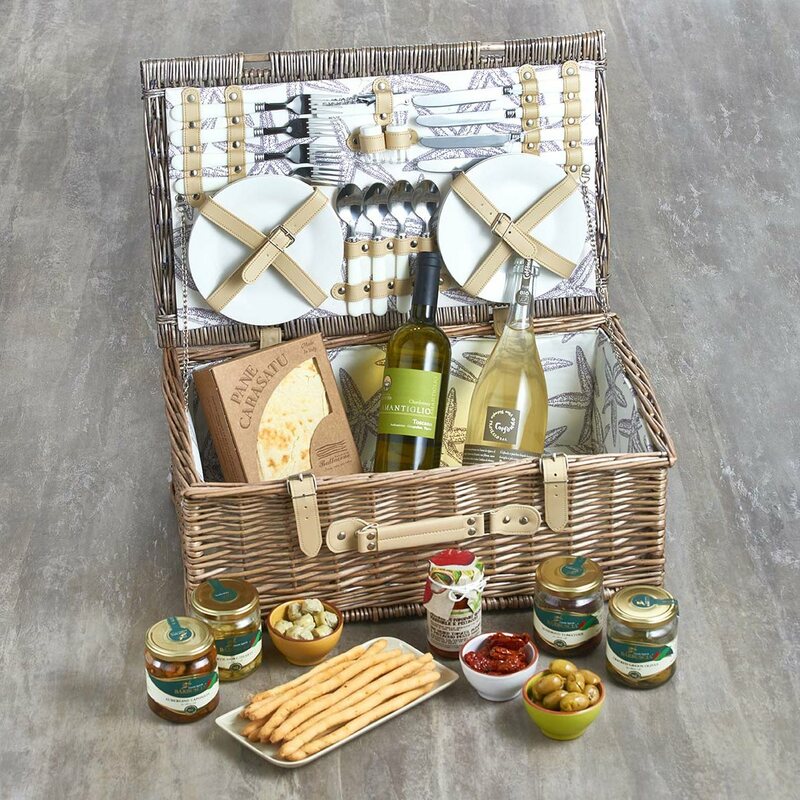 Celebrate the sunshine with our lovely picnic hamper for four people packed with all of the essentials they will need for their al fresco adventure (including plates, cutlery and salt and pepper pots) as well as a selection of Italian food and wine. Sun Dried Tomato, Almond & Pistachio Patè (180g) Sun dried tomato paté with a twist! If you enjoyed our simple sun dried tomato paté we think you will love this! We tried it as a quick and easy pasta sauce – straight from the jar into the pasta and it was delicious! Otherwise, fabulous spread on bruschetta or bread, with or without some creamy cheese! Grilled Aubergine & Aged Pecorino Antipasto (190g) This delicious antipasto is an explosion of sweet and salty flavours in a jar! Made with wonderful grilled Mediterranean aubergines and Pecorino cheese, it can be eaten cold or warm, spread onto a bruschetta or a pizza or alongside meat or fish. Artichoke Hearts in Olive Oil (314ml) These tasty whole Italian artichoke hearts are a much loved Sicilian antipasto. Super soft and tender but crisp at the same time, they have been selected and picked one by one, by hand and placed fresh into the jar. They are preserved in locally produced Sicilian olive oil. Sicilian Green Cracked Olives (314ml) These slightly spicy, crushed olives have a bold flavour making them ideal for an aperitivo or a snack in their own right. Sun Dried Tomatoes in Olive Oil (314ml) Our tomatoes are dried in the Sicilian sun and are naturally red from ripening. They have a beautifully intense taste and can be cooked or eaten fresh from the jar. Rosemary Breadsticks (150g) These make a healthy and satisfying snack on their own or can be served as an alternative to bread alongside a salad or with antipasti. They are also delicious dipped in soft cheese or wrapped in charcuterie. Organic Taralli from Puglia (200g) Taralli are a deliciously addictive snack typical of the Southern region of Puglia. Made with all natural ingredients and olive oil, they are light but crunchy and satisfying at the same time! Sardinian Carasau Flat Bread (250g) This wafer-thin traditonal Sardinian flat bread is light and crispy. Also known as Music Paper bread or Pane Carasatu, it was originally produced for shepherds to take with them when they stayed away from home for months at a time. It can last up to a year if kept dry. Organic Chardonnay Amantiglio Toscana IGT (750cl) This organic Chardonnay is brilliant straw blond in colour with an elegant appearance. It is a harmonious, balanced wine on the palate with crisp, tasty acidity and rich flavours and a fragrance of fresh apple, grapefruit and mandarin. Organic Bio-dynamic Prosecco (750cl) This wonderful organic, bio-dynamic, natural Prosecco has been made in the Veneto region of Italy with traditional farming techniques, completely organic viticulture and very low intervention. Forget fungicides, pesticides, herbicides on the vines, this wine is pure, kind to the planet and very possibly better for your health. All products are carefully wrapped and presented in a beautiful wicker picnic hamper. A gift message option is available at the checkout. Please note that if we are out of stock of any item we reserve the right to substitute it with the most similar available item. Allergens: almonds, pistachios, wheat, sulphites, milk. Really disappointed it did not come in a wicker basket as expected but a cardboard box. It also said next day delivery, but it arrived the following day causing inconvenience. I am a little reluctant to write this review due to the message implying that less than 5 stars is not acceptable. I believe in reviewing products with honesty and integrity. The hamper was very well received and I am told the produce was delicious. However, it did not arrive for Christmas as was expected. It was ordered in time for delivery before Christmas in accordance with information on the website. I believe this was a failure on the part of the courier and I communicated with the supplier regarding this. Had it arrived on time I would have given 5 stars. I am in Perth Australia and ordered this box for my Neice in London. The delivery was swift and my niece is over the moon with the products in the parcel. In fact she has already made some of the dinners and raves over them. Hi, I can currently only rate you based on your marketing, on-time delivery and the enthusiastic initial response of the recipients of these gifts - as the lucky folks receiving these hampers of goodies won’t be trying the contents until after Christmas. However, when they have tried the different items, I will be happy to let you know if they ‘hit the spot’!